Chances are you or a family member have been told that a root canal is necessary to save a tooth; and at Wheatfield Family Dentristy our focus is to always save your natural teeth when possible. It’s important to understand what will happen during root canal treatment and why this procedure is necessary to save the tooth. 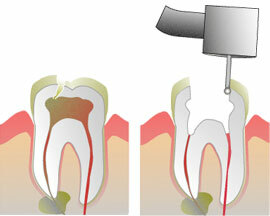 Root canal (endodontic) therapy treats disorders of the nerve (pulp) of the tooth. In the past, a tooth with a diseased or infected nerve had to be removed. However, in 95% of these cases today, this is no longer true. We believe in saving teeth (instead of removing them) and we will make every effort to save yours! Trauma – A physical blow to a tooth or a constant striking by a tooth in the opposite jaw that traumatizes the tooth. Physical Irritation – Deep decay or a very large filling. 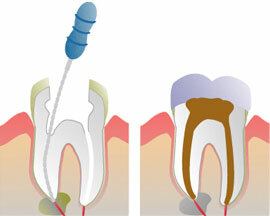 Regardless of the initial cause, the tooth pulp becomes irritated and an abscess ( infection ) occurs. Bacteria from your saliva grows within the tooth pulp, causing pressure and pain. In some cases your face may swell. Eventually the pulp dies, causing the bone around root of the tooth to be destroyed. Once it has been determined ( with X-rays and/or clinical examination ) that root canal treatment is necessary, you will be scheduled for one or more appointments. It is important that you keep these appointments, to prevent delays in treatment and healing. It is also essential that you take all antibiotics and medications prescribed, to hasten healing and reduce swelling. If you experience pain that cannot be controlled with the prescribed medication call our office immediately. This is unusual, but a precaution.